I made this a couple of weeks ago after a craving for pie crust. Does anyone else crave pie crust? I love that stuff! I love it when I actually have time to make my favorite whole wheat pie crust, but time did not allow for that this time, so I used a store bought roll out crust. This was so easy to put together. I actually made it before we headed to church and popped it in the oven when we got home. It was a definite hit with all the kiddos and the husband. I can't wait to make it again! You can jazz it up with some bell peppers and cheese if you want or spice it up with some jalapenos. My husband added some extra sour cream and salsa to top it when serving too. Cook onion and hamburger meat together until meat is cooked and no longer pink. Drain excess grease. Add in taco seasoning and 1/4 cup water. Cook 5-10 minutes until water has cooked down. Stir in black beans, corn, and sour cream. Grease a 8x8 baking dish or deep pie plate. Place one pie crust in the bottom. 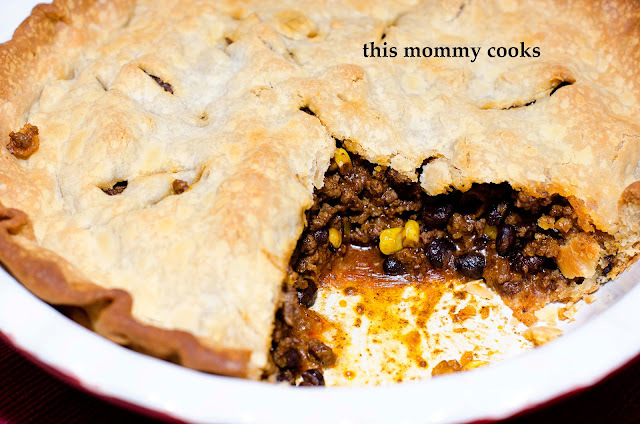 Top with meat mixture and then with second pie crust. Cut slits in top to help steam escape. Bake for 20-30 minutes until pie crust is golden brown. Love this idea; very creative and must be good.